Citation Information: JCI Insight. 2018;3(12):e98214. https://doi.org/10.1172/jci.insight.98214. Pathologic glomerular epithelial cell (GEC) hyperplasia is characteristic of both rapidly progressive glomerulonephritis (RPGN) and subtypes of focal segmental glomerulosclerosis (FSGS). Although initial podocyte injury resulting in activation of STAT3 signals GEC proliferation in both diseases, mechanisms regulating this are unknown. Here, we show that the loss of Krüppel-like factor 4 (KLF4), a zinc-finger transcription factor, enhances GEC proliferation in both RPGN and FSGS due to dysregulated STAT3 signaling. We observed that podocyte-specific knockdown of Klf4 (C57BL/6J) increased STAT3 signaling and exacerbated crescent formation after nephrotoxic serum treatment. 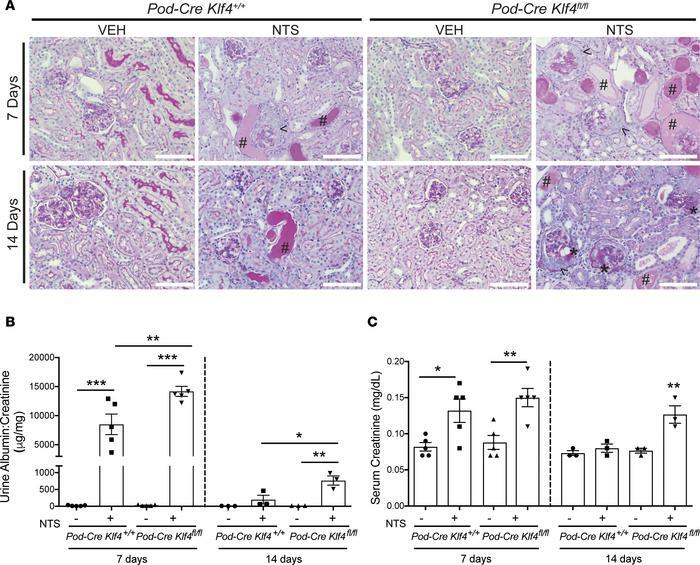 Interestingly, podocyte-specific knockdown of Klf4 in the FVB/N background alone was sufficient to activate STAT3 signaling, resulting in FSGS with extracapillary proliferation, as well as renal failure and reduced survival. In cultured podocytes, loss of KLF4 resulted in STAT3 activation and cell-cycle reentry, leading to mitotic catastrophe. This triggered IL-6 release into the supernatant, which activated STAT3 signaling in parietal epithelial cells. Conversely, either restoration of KLF4 expression or inhibition of STAT3 signaling improved survival in KLF4-knockdown podocytes. Finally, human kidney biopsy specimens with RPGN exhibited reduced KLF4 expression with a concomitant increase in phospho-STAT3 expression as compared with controls. Collectively, these results suggest the essential role of KLF4/STAT3 signaling in podocyte injury and its regulation of aberrant GEC proliferation. NTS-treated Podocin-Cre Klf4fl/fl mice exhibit a significant increase in crescent formation, albuminuria, and renal failure. Podocin-Cre Klf4fl/fl and Podocin-Cre Klf4+/+ mice were treated with nephrotoxic serum (NTS) or VEH for 7 and 14 days. (A) Representative images of periodic acid-Schiff (PAS) staining (×20) (n = 5 in each group at 7 days and n = 3 in each group at 14 days). Arrowheads show crescents. Pound signs mark tubular casts and dilation. Asterisks show sclerotic glomeruli. (B) Albuminuria (urine albumin/creatinine) and (C) serum creatinine at 7 and 14 days after treatment (n = 5 at 7 days, n = 3 at 14 days; *P < 0.05, **P < 0.01, ***P < 0.001; Kruskal-Wallis test with Dunn’s post hoc test). Scale bars: 100 µm.